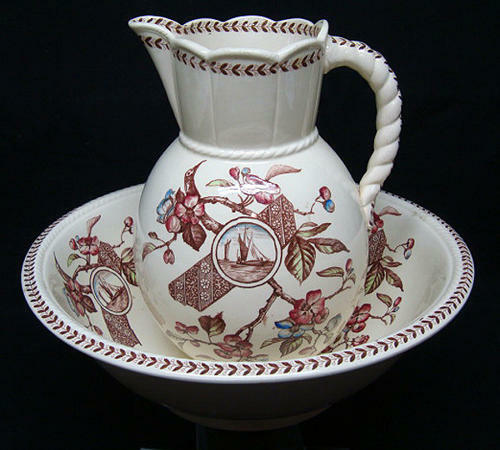 This 19th century wash basin and pitcher are transfer printed in dark brown with under the glaze hand painting in bright red, cobalt blue and leaf green then covered in a pearlware glaze. The large basin bowl is 14 3/4 " in diameter and stands 5 " tall. The massive jug stands 11 3/4 " tall x 8 " wide with a twisted rope handle and roping at the neck.. Rare to find a matched set in this superior pattern and in such pristine condition. This exceptional pattern features triple masted sailboats mixed with Japanesque ribbons and multicolored cherry blossoms. The pattern repeats on the opposite side. Exceptional pieces. Great condition, clean shiny and bright, possibly was never used.